Enhancing nitrogen productivity and economic benefits are the key for organic vegetable production across the Northwest China. 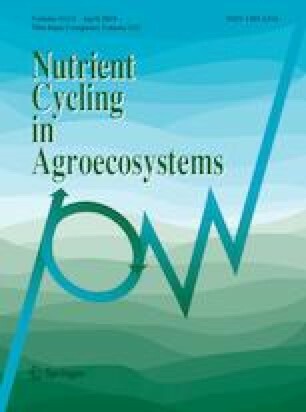 Through three cropping cycles in net house, changes under organic fertilizer (composited cow dung) in combination with different level of corn cobs biochar (BC) in soil mineral nitrogen, growth, yield, nitrogen use efficiency and economic benefits of Organic Chinese Flowering Cabbage (OFCC) were examined. The treatments included: 110.0 t ha−1 organic fertilizer (OF), combination of OF and 8.5 t ha−1 BC (OF + B8.5), combination of OF and 17.0 t ha−1 BC (OF + B17), no OF and BC as control (CK). Results showed that highest vegetative sprouts long and crude, yield and N uptake were obtained from the OF + B8.5. Total annual yield and N uptake of OFCC increased by 43.5% and 47.6% (p < 0.05), respectively, for OF + B8.5 compared with the OF. Meanwhile, OF + B8.5 provided exerted a 52.2% increase in nitrogen agronomic efficiency and 42.3% increase in net income over the OF. However, the OF + B17 did not exert positive effects. These benefits of BC could be attributed partly to mitigation of N leaching as indicated by higher NO3− content in the topsoil and reduced content in the subsoil. In OF + B17, a higher soil NO3− content was measured, however, this did not bring to a higher yield due to nitrogen availability reduced by BC surface functional groups and soil higher C/N relative to that of OF + B8.5. We conclude that application of small amounts of BC can allow farmers to receive higher net income via increased yields. The online version of this article ( https://doi.org/10.1007/s10705-019-09971-6) contains supplementary material, which is available to authorized users. We acknowledge and are grateful the financial support provided by National Natural Science foundation of China (41501312), the National Science and Technology Pillar Program during the 12th 5-year Plan Period (2014BAD05B02) and Beijing Natural Science Foundation (6182012).